SpaceX plans to launch an unmanned test model of the company’s Dragon crew capsule Wednesday on a whirlwind 107-second flight through the skies over Cape Canaveral. The 8-ton prototype spaceship will only reach a mile an altitude, but the trial aims to verify the Dragon capsule can safely escape from a launch failure and save its occupants from a potentially explosive mishap. 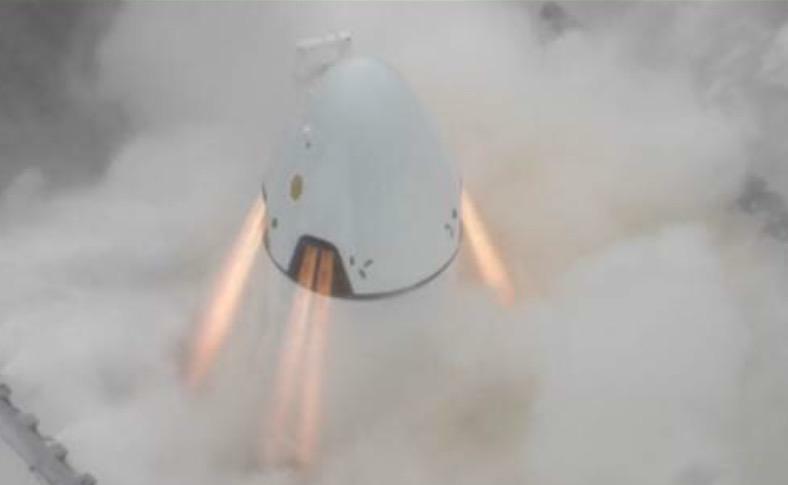 SpaceX says the human-rated spacecraft, which it calls Crew Dragon, will be ready to haul astronauts to the International Space Station in 2017, and Wednesday’s test of the capsule’s abort mechanism is key to proving the ship is safe enough for people. Founded in 2002 by Elon Musk, the Hawthorne, California-based company has changed the landscape of the commercial launch industry with its Falcon 9 rocket. SpaceX now has its sights set on becoming a major U.S. military contractor and a fixture in human spaceflight. 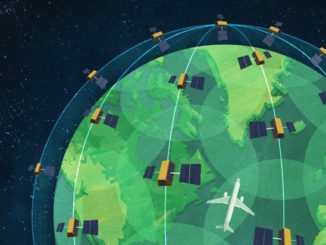 NASA contracted with SpaceX and Boeing last year to develop commercial spaceships to carry astronauts to the space station and end U.S. reliance on Russia for crew transport services. Eight hotrod 3D-printed SuperDraco rocket thrusters mounted around the circumference of the capsule are set to fire at 9 a.m. EDT (1300 GMT) to push the 20-foot-tall spacecraft off SpaceX’s launch pad at Cape Canaveral. Officials will watch for gusty winds that could delay the flight, but forecasters predicted Tuesday a 70 percent chance conditions will be acceptable Wednesday. SpaceX had targeted 7 a.m. EDT (1100 GMT) for the opening of Wednesday’s test window, but a NASA spokesperson said late Tuesday the flight would be delayed at least two hours. Officials did not give a reason for the time change. Officials said the test window extends until 4 p.m. EDT (2000 GMT), and SpaceX has reserved a backup day Thursday if needed. Burning a nearly two-ton supply of hydrazine and nitrogen tetroxide propellants, the SuperDraco thrusters will almost instantly ramp up to 120,000 pounds of thrust, propelling the Dragon spaceship to an altitude of 100 meters — 328 feet — in two seconds. By the time the SuperDracos finish firing, the capsule will be a third of a mile above the launch pad. Put another way, the capsule will go from 0 to nearly 100 mph in one second. Six seconds of propulsion from the SuperDraco engines will send the spacecraft on an arcing trajectory east from the launch pad toward the beach. “By the end of the burn — at the end of the six seconds — you’re going between 150 to 180 meters per second (335 to 402 mph),” said Hans Koenigsmann, SpaceX’s vice president of mission assurance. “You’re going pretty fast for the fact that you only stepped on the gas for six seconds. “That’s faster than a Tesla,” Koenigsmann joked. Tesla Motors is Musk’s other high-profile company, building electric cars and power systems. The Tesla Model S, featuring an “insane mode” made famous with viral videos, can go from 0 to 60 mph in 3.4 seconds. A crash test dummy fastened in the Dragon’s crew cabin will experience nearly 5 G’s at takeoff, and SpaceX engineers installed sensors all over the vehicle to measure acceleration, structural loads, temperatures, acoustics and the environment inside the capsule. 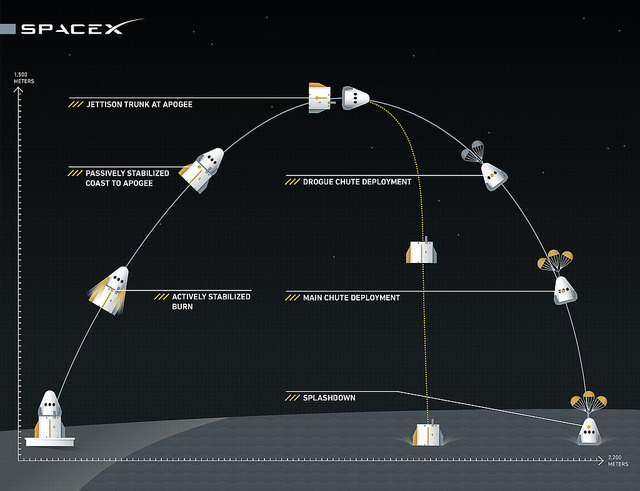 The Dragon will take approximately 21 seconds to reach the apex of its trajectory at an altitude of nearly 5,000 feet. The craft will let go of a disposable trunk section at peak altitude and rotate to point its heat shield toward the ground. Then the capsule will deploy a pair of stabilizing drogue parachutes before unfurling three main parachutes for the final descent. Splashdown in the Atlantic Ocean is targeted for a point 1.4 miles from the flight’s starting point 107 seconds after blastoff. Wednesday’s test flight will demonstrate a safety feature of SpaceX’s Crew Dragon spacecraft designed to drastically improve the odds of survival in the event of a catastrophic launch failure with the capsule’s Falcon 9 booster. The pad abort test is the first of two demonstrations planned by SpaceX this year. Once SpaceX ground crews recover the capsule from the Atlantic Ocean, they will transport the craft to the company’s Central Texas test facility for inspections and refurbishment, then outfit the Dragon for an “in-flight” abort test later this year at Vandenberg Air Force Base in California. 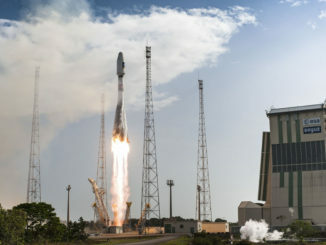 The pair of abort tests will verify that the escape rockets can save astronauts at any point during launch, Reisman said. The in-flight escape test later this year will use a Falcon 9 rocket to boost the capsule to high altitude and trigger an abort under intense aerodynamic forces. 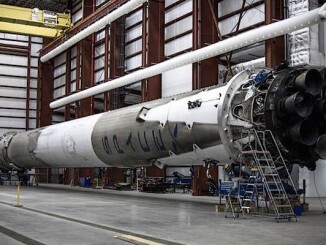 What’s next for SpaceX’s recovered Falcon 9 booster?